As we have already said, the Data Window can be opened either via the “View” menu or by clicking the button in the “Standard” toolbar. Here is what it looks like. It is designed to display price information for the selected bar (Open, High, Low, Close), date and time, as well as volume. It also shows the value of each indicator used, including the custom-made ones. This window serves only an informative role and does not allow the trader to perform any actions regarding the trade or to customize the work space. – Copy is used to copy data from the Data Window into the clipboard for further use in other applications. The same action can be performed by pressing the Ctrl+C key combination. – Last Data shows/hides the latest data column. By checking the Last Data command, an additional column containing the last bar data will appear in the Data Window, next to the data displayed for the bar, on which you have currently scrolled. – Auto Arrange sets up the column size automatically when the Data Window’s size changes. – Grid is used to show/hide the grid separating the window’s columns. 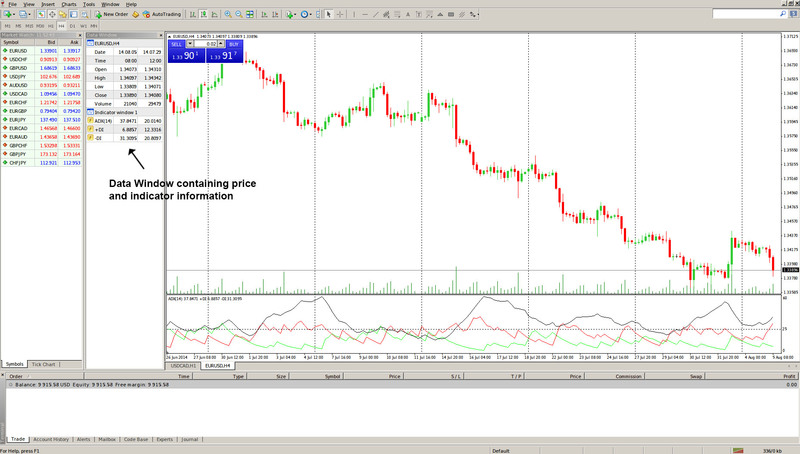 – Show pops up a new window where the trader can choose what information is displayed in the Data Window. Any of the bar prices (Open, Hig, Low, Close), date and time or volume can be selected or de-selected in the sub-menu. Unchecking an element will hide it from display.